Right hand pitcher Sean Poppen may be the most improved Lookouts hurler of the second half. A seven-run fourth inning has propelled the Lookouts to a 9-2 win at AT&T Field on Sunday afternoon. With the victory, Chattanooga has now won each of their last three series against the Braves. Chattanooga got to M-Braves starter Ricardo Sanchez in the second inning after stranding the bases loaded in the first. With runners at first and second, Lookouts leadoff man Zander Wiel smashed a 107 mph line drive at Sanchez, who shielded his face with his left hand, batting the baseball down to the ground. Wiel reached base to load the bases with one out, but Sanchez' health became the main concern. The 21-year-old lefty walked off under his own power to the M-Braves clubhouse and Tyler Pike took over. Pike walked Brent Rooker to force in the first run and another scored on an RBI fielders choice from Luke Raley. The Lookouts left the bases loaded in each of the first two frames, but led 2-0. The game then spiraled out of control for Mississippi in the fourth inning as 12 batters came to the plate in the seven-run frame. Mississippi tied the game at 2-2 in the top of the fourth inning on a two-out, two-run single by Pache. The 19-year-old prospect recorded his first two RBI's bringing home Tyler Marlette and Alejandro Salazar. Pache finished with a 3-for-5 day at the plate and is batting .381 after his first five Mississippi games. The Lookouts answered by sending 12 batters to the plate and scoring seven runs in the bottom of the fourth inning. Pike started the inning and gave up three runs and turned it over to Jason Hursh , who was added to the roster just prior to the game. Hursh surrendered the final four runs, two earned. Seven straight batters reached base with one out as Jaylin Davis drove in a pair with a bases loaded single while Alex Perez, Luis Arraez, Jimmy Kerrigan and Wiel also drove in a run each during the fourth. Davis is now hitting .410 at AT&T Field, the highest home batting average of any Southern League player with at least five at-bats. Chattanooga had six hits in the inning and jumped ahead 9-2. Perez had at least three hits in a game for the first time since going a perfect five-for-five against Birmingham on July 4, while Wiel extended his hitting streak to seven games with a pair of singles. On the mound, Sean Poppen (5-5) picked up his third victory in his last four starts after working five innings of two-run ball, striking out four in the process. Andrew Vasquez and Cody Stashak each threw two scoreless innings in relief. Chattanooga stranded a total of 13 runners on base, but had 12 hits and took advantage of a season-high 12 walks from six M-Braves pitchers. 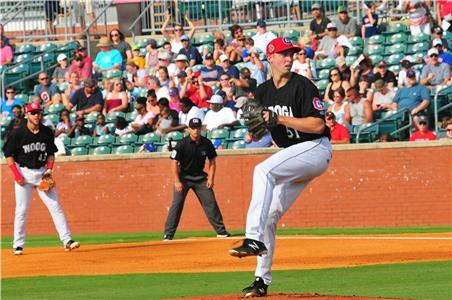 Chattanooga and Mississippi will complete their five-game series on Kids Eat Free Monday, while the Lookouts will then welcome the Jackson Generals to town for five more games beginning on Wednesday. 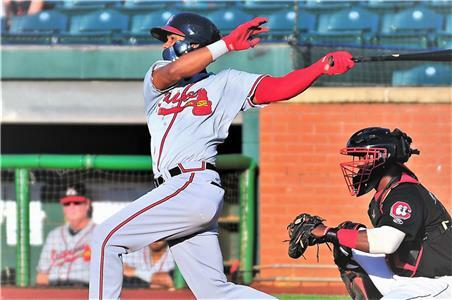 Cristian Pache went 3-for-5 for the Braves Sunday. Pache is the No. 5 prospect of the Atlanta Braves.